Felippe J. Pavinatto, Thatyane M. Nobre, Luciano Caseli, Osvaldo N. Oliveira and Jr. The field of bioactive compounds is very important for both scientific and applicative point of view. This field is interdisciplinary and in this book the authors propose several themes related to chemical composition, sensors, biosensors, electronic sensory systems, interaction modeling and protection methods applied on bioactive compounds. Therefore, the authors propose an integrated approach regarding bioactive compounds including sources, physicochemical detection, interactions with membranes and the protection of bioactive components against environmental factors. This integrated approach is not common in books but I believe that is very useful for specialists and researchers working in inter-, multi- and trans-disciplinary fields related to bioactive compounds. The book could be of interest for scientists specialized on chemistry, biochemistry, pharmacy as well as for persons working in food industry, biotechnology, nanotechnology etc. This book will be helpful for a wide range of readers - from university students to researchers. I think that the authors can be confident that there will be many grateful readers who will have gained a broader perspective of the fields of bioactive compounds as a result of their efforts. This book presents the composition and health benefices of bioactive compounds from natural products, and the principal methods used for separation, detection, quantification and protection of bioactive compounds. A special attention is devoted to membrane model interactions as well as to sensors and biosensors development. Chapter 1 deals with the description of chemical composition of olive oil, highlighting the chemical structure and health benefices of biologic active compounds present in this food. Chapter 2 describes the composition, chemical structures and benefices of bioactive compounds from red wine. A special attention is devoted to polyphenolic compounds, especially to resveratrol, a compound with multiple benefices and without toxic effects. Chapter 3 presents the recent advances in the analysis of bioactive compounds based on molecular recognition. Separation techniques (solid phase extraction, chromatography, electrophoresis), and sensing (electrochemical, optical, etc.) are revised. Chapter 4 describes the electrochemical sensors, especially voltammetric sensors, dedicated to the analysis of antioxidants. The principal methods used to improve voltammetric sensors selectivity and sensitivity by modifying the surface using chemical or biological materials are described, also. Chapter 5 presents the most representative and novel biosensors for the detection of polyphenols, biogenic amines, mycotoxins and allergens in wine, emphasizing the wealth of biosensing strategies and the particularities of wine as a complex analytical matrix. Chapter 6 provides a review of the most recent works in the field of electronic sensory system for characterization of bioactive compounds, from electronic noses to sensors and biosensors. Chapter 7 describes the use of Langmuir monolayers as cell membrane models made to interact with bioactive compounds. Trends in the field are discussed as motivation for innovative research to bridge the gap between biology (and medicine) and the physicochemical framework used in cell membrane modeling. 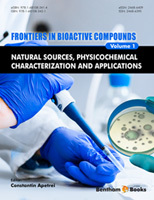 The book closes with Chapter 8 presenting the newest information about the bioactive compounds encapsulation, which ensures the stability of the volatile compounds during thermal processing, the protection of bioactive components against environmental factors, the increase of the solubility of bioactive compounds, and the controlled release of bioactive components. I appreciatively acknowledge the distinguished specialists who contributed in this book. I consider myself privileged to have had the occasion to work together with colleagues of universities from Spain, Italy, Brazil and Romania. Finally, I want to thank Bentham Science Publishers for the opportunity to edit this book.